Virtual Workforce® is an Enterprise automation solution encompassing many of the principles covered in this overview. It is an as-a-service software solution which provides a platform for clients to automate a wide variety of IT and business support processes and activities. It is focused on delivering high levels of resilience, security and scalability and a commercial approach which allows users to relate the cost of the solution directly to the benefits being realised. The Virtual Workforce utilises RPA approaches, adding advanced load balancing, workload management, multi-tasking and auto-scaling algorithms to provide a highly flexible platform which can deliver rapid and non-disruptive automation. Has the services industry finally found renewed growth with emerging delivery models? It is that time of the quarter again; we are about to see a whole raft of quarterly results for Q3. HfS uses the results as a barometer for market performance, and we make decisions around the market sizing and forecasting from these numbers. The Q3 figures will give us three-quarters of the year’s results, so they start to give us a good idea of what the year is shaping up to be. We have already seen some important results from the early announcers, Accenture, TCS, Infosys, IBM, Wipro and WNS providing us with an indication of what is to come and speculate about the overall results. 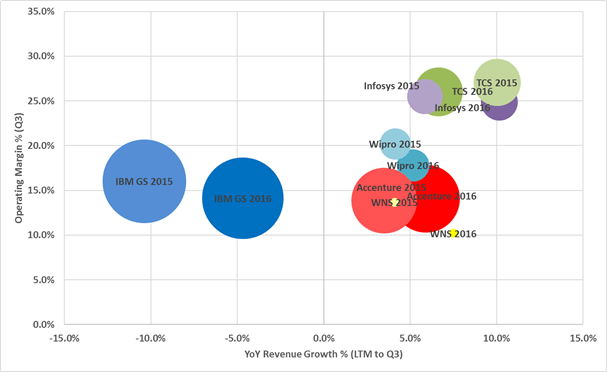 As we mentioned in our recent analysis of the HCL / IBM partnership, the IT market has become much more complicated. For services buyers, it has impacted their ability to choose the right solution alignment for their businesses and for service providers in selecting the optimum places to make their investments. This is exacerbated further with the emergence of new disruptive competitors, both on client and provider sides, threatening the marketplace. In the past, we tried to simplify this market disruption by characterizing it as “two tier”, with service providers either being traditional or more “As-a-Service.” The theory, over the past 2-3 years, has been that growth will be slow, or non-existent, in the traditional services markets, while we will see emerging As-a-Service markets like cloud, BPaaS, digital and intelligent automation, growing in multiple double digits. Many of the traditional providers will experience revenue declines in this period as they burn through their backlogs of legacy contracts, particularly the large multi-tower outsourcing deals they may have. With most of these contracts morphing into As-a-Service delivery models or becoming increasingly cheap as the FTEs get reduced over time. When we looked at the early announcers, at the start of the year, we predicted that the market would find renewed growth, as the market started to adopt the Ideals of As-a-Service, and growth in new business outweighing the decline of traditional spend. If you look at the performance of the early announcers in the chart, broadly this is true, with all the providers improving in revenue growth over the past four quarters, compared to the same four quarters last year. We use the twelve-month trailing data, as quarterly growth for individual companies can often fluctuate, and this gives a better direction of travel. It is still early days – both with these secular changes to the market and in the results season for this quarter. However, if we see the rest of the market improve in a similar vain, we may well see growth rates improve for the IT and BPO services market, right across the board. This may be confined to more discretionary IT services markets like consulting and systems integration for the time being, and industry-specific BPO markets, such as insurance and healthcare. However, if this trend continues, we may see growth in infrastructure management spend in 2017. This is particularly significant for infrastructure as the market has been in decline for the last three years. Over the next two months, as we digest all the results from the major IT and business services firms, we will form a viewpoint whether the market, as a whole, is seeing improvement and in what sectors. For example, whether the shift left of the offshore majors is set to continue in 2016 and beyond. We may also start to see signs that the IT and business services market might escape the low single digital purgatory it has been stuck for the last five years. Source: hfs.com – Has the services industry finally found renewed growth with emerging delivery models? For years, business case for the offshore captive IT center model — whereby companies set up their own wholly owned IT service centers abroad — has centered on the benefits of labor arbitrage to generate cost savings. However, as the return on salary differentials has dwindled and the pressure on captive centers to create additional value, companies are looking to other sources of lower costs and increased efficiencies. The current rise of robotic process automation (RPA) presents an opportunity for IT organizations to wring more benefits from their offshore delivery centers. The rapidly advancing technology that is used to automate rules-based and repetitive tasks with limited or no human involvement is growing in popularity among the captive center set, says Sarah Burnett, vice president of research with outsourcing research firm and consultancy Everest Group. RPA offers a number of benefits: incremental cost savings over traditional offshore delivery; improved service delivery in the form of process quality, speed, governance, security and continuity; relatively shorter investment recovery periods; and a general ease of implementation. CIO.com asked Burnett about the increased adoption of RPA and offshore captive centers, the hard benefits of implementation, and the best way to build a business case for automation in offshore IT delivery centers. CIO.com: Why are functions that are already offshored ripe for the application of RPA? Are onshore IT and business operations also candidates? Sarah Burnett: RPA is a no brainer for most transactional services irrespective of whether they are offshored or not. RPA can help lower costs while increasing the efficiency of operations. This can help global In-house centers or shared service centers achieve their year-on-year efficiency targets. [Our recent research] shows that costs of operations in offshore global in-house centers can be lowered by 20 to 25 percent. The savings would be even higher for onshore centers. RPA can also address specific issues such as shortage of resources and skills and where there is a high rate of staff attrition due to the repetitive and boring nature of transactional work. CIO.com: You’ve noted that RPA has the potential to reduce headcount by 25 to 45 percent resulting in significant cost savings. Does the business case for RPA need to address more than headcount reductions? Burnett: Headcount reduction is enough of a factor for some enterprises, but not all automate with that as a top priority. Some want to keep the staff and create capacity for other more complex work or address issues such as an influx of new work. It is also important to note that automation is not just about headcount reduction, but also increased quality and standardization of work. CIO.com: What are the biggest factors that would impact the business case of RPA in an offshore location? Burnett: I think increasing salaries and shortage of skills could drive demand for automation. Clients of offshore centers are also driving automation for increased efficiency and throughput. This is part of their continuous and year-on-year improvement. One factor that could adversely affect automation in offshore centers is lack of skills for deployment. CIO.com: What should organizations consider in order to build a realistic business case for RPA? Burnett: The existing and potential costs and benefits of all of these [issues] should be factored into the business case. There are costs that are easy to measure, e.g., cost of RPA software licenses. [But] there are also qualitative values, such as reduced error rates, that are difficult to measure but these must be factored in for a comprehensive business case. CIO.com: What other advice would you offer IT organizations considering implementing RPA in captive centers? Burnett: It is important to benchmark existing operations to work out the benefits of automation and build a business case for deployment and scaling up. If you have any comment, please feel free to add it. Thus far our quest for robotic process automation (RPA) enlightenment has focused on some of the personalities building this emerging industry – from software providers, outsourcers and implementers. Alex Nield is Head of Solution Design for Business Services at Direct Line Group (DLG), and he represents the most important constituency in RPA-land: the small but growing cadre of ‘RPA buyers’. These are the organisations that have actually turned to RPA to transform the efficiency and effectiveness of their operations. It is time for Live Wires to get real. As a leading UK insurer, DLG has faced many of the challenges confronting other fast-growing corporates: how do we do more with less? How do we make our people more productive? How do we make our systems work together? How do we make our customer interactions as good as they possibly can be? All big questions, and in mid-2015, Alex and his colleagues picked up on some of the promises that were emerging around RPA at that time, seeing it as a potential tool in the ongoing fight for improvement and transformation. Initial questions on “what is RPA?” grew into an appetite to dig deeper, and by the end of 2015 DLG launched of a Proof of Concept to kick the tyres of RPA. A lot has been learnt in the meantime, and happily Alex is still here to tell the tale. Direct Line’s initial RPA work has focused primarily on finance, front office and customer-intensive processes, interfacing with a wide range of mainframe, Java and core ops systems. Initial prototypes were promising: “When we plugged RPA in it did work – we were quickly able to show off initial demos.” This created quite a buzz, validating the sort of productivity savings RPA software vendors have been proclaiming (with robots 5-10 times more productive than manual processing). This enabled the team to secure funding for a wider RPA rollout, to see what could be achieved over a one-year period. But moving from Proof of Concepts to larger, live implementation, Alex’s team quickly encountered a key robotics learning: to make real progress with RPA you need to get into a lot of detail. “The idea that you rock up and bash out a process is not quite right. You need far more rigour, structure and interest. The devil is in the detail.” Proofs of Concepts do require a moderate level of detail; but live implementations need to be enterprise-grade projects, so the robot can handle mission-critical client and operational data in line with the right process, rules and rigour – for all possible scenarios. The bulk of implementation work, rather than lying purely in the configuration of the robot tool itself, resides in process analysis and customer interaction. Legacy process maps might make the job easier, but rarely do they provide all of the detail. Plus there is the task of change management. RPA may take longer than some might expect, but it is still significantly faster than traditional technology projects – meaning that change management, above all the first time round, needs to be handled expertly. The right stakeholders, including the business and IT, need to be actively engaged, so that the robot programme can take root quickly. So what does the future look like? Will the robot estate gradually spread across the entire organisation? For Alex, RPA will be an important feature of the future landscape, but not the only one. “RPA is not the solution itself, it is part of a suite of solutions you might deploy.” Artificial intelligence may be on the automation menu at some stage, but at present the main courses are more familiar dishes such as self-service, multi-channel platforms, ERP and process re-engineering. Location activity in the global sourcing industry declined significantly in Q3 2016 from the previous quarter, with 404 deals in Q3 compared to 429 in Q2, according to Everest Group, a consulting and research firm focused on strategic IT, business services and sourcing. Although outsourcing activity across North America increased during the quarter (with share of transactions jumping from 31 to 37 percent), there was a 24 percent decline in the number of deals across Europe (except in the United Kingdom, which reported no change in activity), and the rest of the world experienced a decline as well. Conversely, Global In-house Center (GIC) setup activity reached 37 setups in Q3 2016, an all-time high, led by new adopters setting up their first delivery centers. GIC activity on a year-to-year basis also witnessed increased traction, reflecting the growing importance of in-house centers to enterprises. Everest Group’s Q3 2016 research suggests that a key trend to watch is increasing service provider investments in cybersecurity. Between 2015 and 2016, service providers have ramped up their cybersecurity portfolios via strategic acquisitions, organic growth and collaborative alliances with technology firms. “As enterprises increasingly adopt digital services, robust cybersecurity programs are becoming ‘must have,’” said H. Karthik, partner at Everest Group. “This, in turn, is forcing service providers to continuously evolve their offerings and move toward end-to-end cybersecurity services. Most businesses find themselves having to outsource to get stuff done. This especially happens with small and medium-sized businesses, but it’s not at all uncommon for huge brands as well. In this blog post, I will be highlighting what, how and when you should outsource – in order to grow your business, get more clients, shorten your workload, and generally make your life much easier. In my experience, many of the entrepreneurs I’ve met want to do everything themselves, thinking this would save them money and time. I believe however that this is a big misconception. It might seem more expensive in the short run to pay others to do something that you might (or might not) be able to do yourself, but in the long run, it can have a lot of benefits for your business, and your overall mental and physical health. Outsourcing can give you the time you need to focus on your business, which can then help you grow and evolve. And, if you find the right freelancers and/or agencies, they might get you better results than you ever could. Most businesses have a lot of very different needs, some technical, some creative, but whatever they are, you’re probably not ever going to find one person that can do all of these things for your business as a 9 to 5 employee. Hiring specialists for each of your needs wouldn’t make sense either unless you’re a huge company– after all, you won’t need a web developer to be there every day at the office, or a full-time social media marketer to tweet every minute. You also can’t overwork your existing employees by giving them extra tasks that they might not even know anything about. And that is when you should start considering outsourcing these jobs to freelancers or agencies. With technology at the level that it is, it’s very easy to find people that can help with probably anything you can think of – all you have to do is look for them, and find the ones that can do a good job for you. This has a very simple, straightforward answer: when you need it. Chances are, you’re going to need to outsource sooner rather than later. As I mentioned earlier, you won’t have the time everything yourself, and it would make no business sense to hire someone full-time for every department. So when you find yourself spending way too much time doing something that you don’t really need to – like editing a video when you really have no knowledge how to, or managing all of your meetings when you barely have time to actually attend those meetings – then it’s probably time to look for someone to outsource that task to. Something that might be helpful is if you make an extensive list of each and everything that needs to be done on a day-to-day basis, and make estimations on how much time each one takes you to do. If you’re spending too much time on something, consider outsourcing it – you’re sure to find plenty of talented freelancers that can help. Likewise, if there are any tasks that you don’t really know how to do, either hire someone full time if there’s a need for it or hire a freelancer/agency to do it for you. I think there are two main types of tasks that can be outsourced: the things you can do, but that ultimately take too much of your time, like setting up meetings, keeping files organized, and data entry (basically admin type duties) and those more specialized tasks that you can’t really do yourself, such as accounting or web development. Virtual Office Assistant – a good VA can be an incredible asset to a business, especially with smaller businesses. Virtual Assistants work remotely, so you don’t have to worry about the supplies he or she might need, and, since they work as freelancers or independent contractors, you also won’t be paying extra in terms of taxes or health insurance for example. Virtual Office Assistants are a great place to start your outsourcing, as they will help you free up a lot of time by managing all of the admin duties. Schedule management – managing your schedule and everything that it implies can be very time-consuming; get a virtual office assistant and let them handle your schedule – this way, you can use the free time to focus on preparing for your meetings. Organise all of your files – let your VA handle the organising of your files, as well as keep an evidence of all your passwords, login details and other useful information. Web developer – Nowadays it’s quite easy to create your own site with WordPress, Wix and other similar services, but usually it’s better to go to the professionals to create a great site that looks good while also moving fast. For most businesses, it wouldn’t make sense to hire a web developer full time. In my opinion, it’s best to find a talented web developer that can help you build your website and that you can then keep on call for any future issues or requests. Create the logo, banners and other visuals you might need – this is definitely a job for the experts, especially if you want your website to look as good as possible. Not only is it time-consuming, but without the necessary experience, you won’t be able to create the type of visual content that can help you stand out. Social Media Marketing – I think at this point having a social media presence, however small, is almost imperative to any business. There’s two ways to manage social media: either find a freelancer or agency to handle all of your social media for you, or find a consultant who will teach you and your team how to manage your social media, and give you a clear strategy that you can easily follow without having to spend too much time on it. If you want to have a big presence on social media, it might make more sense to hire someone to do it for you, although this can turn out quite expensive in the long run. On the other hand, a consultant can help you come up with a plan that you can apply in-house between the members of your team, and it wouldn’t take much time from your daily schedule. It will also be less expensive, as it’s only a one-off fee. Monitoring and responding to mentions – in order to get the best possible results from social media, you need to be online most of the time, and ready to respond and engage all day long. Outsource this task, and you will be able to relax while someone else monitors any mentions and activity and reacts accordingly. Search Engine Optimisation – If you want people to be able to easily find your website online, and discover your business then you’re going to need a good SEO strategy in place. Even if you’re familiar with SEO, it’s one of those duties that make more sense to outsource. SEO is also constantly changing, so you need someone who knows what they’re doing to get you in those top spots in Google searches. Link Building – link building is a very time-consuming task. You would need to look for opportunities, establish relationships and get others to link to your content. Optimising your website for search engines – optimising your website is very important and there are lots of different aspects to consider. Content Creation – content marketing is a big part of digital marketing nowadays, with many businesses now having their own blog to drive traffic and find more leads. However, it can be extremely time-consuming to write as much content as you are going to need. Visual content creation such as branded images, infographics and videos – visual content can be fun to create but it can also take a lot of time. Outsource this task and you can simply focus on promoting this content. Blog posts – as I mentioned earlier, content creation can take a lot of your time; if you do outsource this task, make sure you hire someone who knows what they’re talking about and knows your blog’s tone of voice. Managing your blog – you can free up a lot of time by getting someone to upload your blog posts, optimising them for SEO, publishing posts and responding to any comments. Outsourcing is a real necessity in today’s business world. There’s simply too much to do for a small team to be able to handle, and even with bigger teams, it makes much more sense financially to outsource. The tasks I’ve mentioned in this post are just some of the ones that can be outsourced, but I tried to focus more on those that are common to more businesses. At the end of the day, you have to consider what is taking too much of your time and could easily be done by another person, virtually.